An example of merge sort. First divide the list into the smallest unit (1 element), then compare each element with the adjacent list to sort and merge the two adjacent lists. Finally all the elements are sorted and merged. 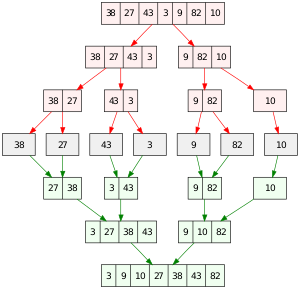 In computer science, merge sort (also commonly spelled mergesort) is an efficient, general-purpose, comparison-based sorting algorithm. Most implementations produce a stable sort, which means that the order of equal elements is the same in the input and output. Merge sort is a divide and conquer algorithm that was invented by John von Neumann in 1945. A detailed description and analysis of bottom-up mergesort appeared in a report by Goldstine and von Neumann as early as 1948. Divide the unsorted list into n sublists, each containing one element (a list of one element is considered sorted). Repeatedly merge sublists to produce new sorted sublists until there is only one sublist remaining. This will be the sorted list. Example C-like code using indices for top-down merge sort algorithm that recursively splits the list (called runs in this example) into sublists until sublist size is 1, then merges those sublists to produce a sorted list. The copy back step is avoided with alternating the direction of the merge with each level of recursion. Pseudocode for top-down merge sort algorithm which recursively divides the input list into smaller sublists until the sublists are trivially sorted, and then merges the sublists while returning up the call chain. In this example, the merge function merges the left and right sublists. // Either left or right may have elements left; consume them. Pseudocode for bottom-up merge sort algorithm which uses a small fixed size array of references to nodes, where array[i] is either a reference to a list of size 2i or nil. node is a reference or pointer to a node. The merge() function would be similar to the one shown in the top-down merge lists example, it merges two already sorted lists, and handles empty lists. In this case, merge() would use node for its input parameters and return value. Tournament replacement selection sorts are used to gather the initial runs for external sorting algorithms. A recursive merge sort algorithm used to sort an array of 7 integer values. These are the steps a human would take to emulate merge sort (top-down). In sorting n objects, merge sort has an average and worst-case performance of O(n log n). If the running time of merge sort for a list of length n is T(n), then the recurrence T(n) = 2T(n/2) + n follows from the definition of the algorithm (apply the algorithm to two lists of half the size of the original list, and add the n steps taken to merge the resulting two lists). The closed form follows from the master theorem for divide-and-conquer recurrences. In the worst case, the number of comparisons merge sort makes is given by the sorting numbers. These numbers are equal to or slightly smaller than (n ⌈lg n⌉ − 2⌈lg n⌉ + 1), which is between (n lg n − n + 1) and (n lg n + n + O(lg n)). In the worst case, merge sort does about 39% fewer comparisons than quicksort does in the average case. In terms of moves, merge sort's worst case complexity is O(n log n)—the same complexity as quicksort's best case, and merge sort's best case takes about half as many iterations as the worst case. Merge sort is more efficient than quicksort for some types of lists if the data to be sorted can only be efficiently accessed sequentially, and is thus popular in languages such as Lisp, where sequentially accessed data structures are very common. Unlike some (efficient) implementations of quicksort, merge sort is a stable sort. Merge sort's most common implementation does not sort in place; therefore, the memory size of the input must be allocated for the sorted output to be stored in (see below for versions that need only n/2 extra spaces). Variants of merge sort are primarily concerned with reducing the space complexity and the cost of copying. A simple alternative for reducing the space overhead to n/2 is to maintain left and right as a combined structure, copy only the left part of m into temporary space, and to direct the merge routine to place the merged output into m. With this version it is better to allocate the temporary space outside the merge routine, so that only one allocation is needed. The excessive copying mentioned previously is also mitigated, since the last pair of lines before the return result statement (function merge in the pseudo code above) become superfluous. Katajainen et al. present an algorithm that requires a constant amount of working memory: enough storage space to hold one element of the input array, and additional space to hold O(1) pointers into the input array. They achieve an O(n log n) time bound with small constants, but their algorithm is not stable. Several attempts have been made at producing an in-place merge algorithm that can be combined with a standard (top-down or bottom-up) merge sort to produce an in-place merge sort. In this case, the notion of "in-place" can be relaxed to mean "taking logarithmic stack space", because standard merge sort requires that amount of space for its own stack usage. It was shown by Geffert et al. that in-place, stable merging is possible in O(n log n) time using a constant amount of scratch space, but their algorithm is complicated and has high constant factors: merging arrays of length n and m can take 5n + 12m + o(m) moves. This high constant factor and complicated in-place algorithm was made simpler and easier to understand. Bing-Chao Huang and Michael A. Langston presented a straightforward linear time algorithm practical in-place merge to merge a sorted list using fixed amount of additional space. They both have used the work of Kronrod and others. It merges in linear time and constant extra space. The algorithm takes little more average time than standard merge sort algorithms, free to exploit O(n) temporary extra memory cells, by less than a factor of two. Though the algorithm is much faster in a practical way but it is unstable also for some lists. But using similar concepts, they have been able to solve this problem. Other in-place algorithms include SymMerge, which takes O((n + m) log (n + m)) time in total and is stable. Plugging such an algorithm into merge sort increases its complexity to the non-linearithmic, but still quasilinear, O(n (log n)2). An alternative to reduce the copying into multiple lists is to associate a new field of information with each key (the elements in m are called keys). This field will be used to link the keys and any associated information together in a sorted list (a key and its related information is called a record). Then the merging of the sorted lists proceeds by changing the link values; no records need to be moved at all. A field which contains only a link will generally be smaller than an entire record so less space will also be used. This is a standard sorting technique, not restricted to merge sort. Merge sort type algorithms allowed large data sets to be sorted on early computers that had small random access memories by modern standards. 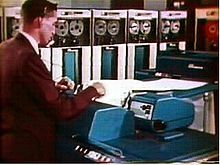 Records were stored on magnetic tape and processed on banks of magnetic tape drives, such as these IBM 729s. An external merge sort is practical to run using disk or tape drives when the data to be sorted is too large to fit into memory. External sorting explains how merge sort is implemented with disk drives. A typical tape drive sort uses four tape drives. All I/O is sequential (except for rewinds at the end of each pass). A minimal implementation can get by with just two record buffers and a few program variables. Merge pairs of records from A; writing two-record sublists alternately to C and D.
Merge two-record sublists from C and D into four-record sublists; writing these alternately to A and B.
Repeat until you have one list containing all the data, sorted—in log2(n) passes. Instead of starting with very short runs, usually a hybrid algorithm is used, where the initial pass will read many records into memory, do an internal sort to create a long run, and then distribute those long runs onto the output set. The step avoids many early passes. For example, an internal sort of 1024 records will save nine passes. The internal sort is often large because it has such a benefit. In fact, there are techniques that can make the initial runs longer than the available internal memory. With some overhead, the above algorithm can be modified to use three tapes. O(n log n) running time can also be achieved using two queues, or a stack and a queue, or three stacks. In the other direction, using k > two tapes (and O(k) items in memory), we can reduce the number of tape operations in O(log k) times by using a k/2-way merge. A more sophisticated merge sort that optimizes tape (and disk) drive usage is the polyphase merge sort. Tiled merge sort applied to an array of random integers. The horizontal axis is the array index and the vertical axis is the integer. Also, many applications of external sorting use a form of merge sorting where the input get split up to a higher number of sublists, ideally to a number for which merging them still makes the currently processed set of pages fit into main memory. // Sort elements lo through hi (exclusive) of array A.
if lo+1 < hi then  // Two or more elements. time if enough processors are available. Such a sort can perform well in practice when combined with a fast stable sequential sort, such as insertion sort, and a fast sequential merge as a base case for merging small arrays. Merge sort was one of the first sorting algorithms where optimal speed up was achieved, with Richard Cole using a clever subsampling algorithm to ensure O(1) merge. Other sophisticated parallel sorting algorithms can achieve the same or better time bounds with a lower constant. For example, in 1991 David Powers described a parallelized quicksort (and a related radix sort) that can operate in O(log n) time on a CRCW parallel random-access machine (PRAM) with n processors by performing partitioning implicitly. Powers further shows that a pipelined version of Batcher's Bitonic Mergesort at O((log n)2) time on a butterfly sorting network is in practice actually faster than his O(log n) sorts on a PRAM, and he provides detailed discussion of the hidden overheads in comparison, radix and parallel sorting. Although heapsort has the same time bounds as merge sort, it requires only Θ(1) auxiliary space instead of merge sort's Θ(n). On typical modern architectures, efficient quicksort implementations generally outperform mergesort for sorting RAM-based arrays. On the other hand, merge sort is a stable sort and is more efficient at handling slow-to-access sequential media. Merge sort is often the best choice for sorting a linked list: in this situation it is relatively easy to implement a merge sort in such a way that it requires only Θ(1) extra space, and the slow random-access performance of a linked list makes some other algorithms (such as quicksort) perform poorly, and others (such as heapsort) completely impossible. As of Perl 5.8, merge sort is its default sorting algorithm (it was quicksort in previous versions of Perl). In Java, the Arrays.sort() methods use merge sort or a tuned quicksort depending on the datatypes and for implementation efficiency switch to insertion sort when fewer than seven array elements are being sorted. The Linux kernel uses merge sort for its linked lists. Python uses Timsort, another tuned hybrid of merge sort and insertion sort, that has become the standard sort algorithm in Java SE 7 (for arrays of non-primitive types), on the Android platform, and in GNU Octave. ^ Katajainen, Jyrki; Träff, Jesper Larsson (March 1997). "A meticulous analysis of mergesort programs" (PDF). Proceedings of the 3rd Italian Conference on Algorithms and Complexity. Italian Conference on Algorithms and Complexity. Rome. pp. 217–228. CiteSeerX 10.1.1.86.3154. doi:10.1007/3-540-62592-5_74. ^ Powers, David M. W. and McMahon Graham B. (1983), "A compendium of interesting prolog programs", DCS Technical Report 8313, Department of Computer Science, University of New South Wales. ^ Cormen; Leiserson; Rivest; Stein. Introduction to Algorithms. p. 151. ISBN 978-0-262-03384-8. ^ Katajainen, Jyrki; Pasanen, Tomi; Teuhola, Jukka (1996). "Practical in-place mergesort". Nordic J. Computing. 3 (1): 27–40. CiteSeerX 10.1.1.22.8523. ^ Geffert, Viliam; Katajainen, Jyrki; Pasanen, Tomi (2000). "Asymptotically efficient in-place merging". Theoretical Computer Science. 237: 159–181. doi:10.1016/S0304-3975(98)00162-5. ^ Huang, Bing-Chao; Langston, Michael A. (March 1988). "Practical In-Place Merging". Communications of the ACM. 31 (3): 348–352. doi:10.1145/42392.42403. ^ Kim, Pok-Son; Kutzner, Arne (2004). Stable Minimum Storage Merging by Symmetric Comparisons. European Symp. Algorithms. Lecture Notes in Computer Science. 3221. pp. 714–723. CiteSeerX 10.1.1.102.4612. doi:10.1007/978-3-540-30140-0_63. ISBN 978-3-540-23025-0. ^ Selection sort. Knuth's snowplow. Natural merge. ^ Powers, David M. W. Parallelized Quicksort and Radixsort with Optimal Speedup, Proceedings of International Conference on Parallel Computing Technologies. Novosibirsk. 1991. ^ jjb. "Commit 6804124: Replace "modified mergesort" in java.util.Arrays.sort with timsort". Java Development Kit 7 Hg repo. Archived from the original on 2018-01-26. Retrieved 24 Feb 2011. ^ "Class: java.util.TimSort<T>". Android JDK Documentation. Archived from the original on January 20, 2015. Retrieved 19 Jan 2015. ^ "liboctave/util/oct-sort.cc". Mercurial repository of Octave source code. Lines 23-25 of the initial comment block. Retrieved 18 Feb 2013. Code stolen in large part from Python's, listobject.c, which itself had no license header. However, thanks to Tim Peters for the parts of the code I ripped-off. Knuth, Donald (1998). "Section 5.2.4: Sorting by Merging". Sorting and Searching. The Art of Computer Programming. 3 (2nd ed.). Addison-Wesley. pp. 158–168. ISBN 0-201-89685-0. Kronrod, M. A. (1969). "Optimal ordering algorithm without operational field". Soviet Mathematics - Doklady. 10. p. 744. LaMarca, A.; Ladner, R. E. (1997). "The influence of caches on the performance of sorting". Proc. 8th Ann. ACM-SIAM Symp. on Discrete Algorithms (SODA97): 370–379. CiteSeerX 10.1.1.31.1153. Skiena, Steven S. (2008). "4.5: Mergesort: Sorting by Divide-and-Conquer". The Algorithm Design Manual (2nd ed.). Springer. pp. 120–125. ISBN 978-1-84800-069-8. Sun Microsystems. "Arrays API (Java SE 6)". Retrieved 2007-11-19. Oracle Corp. "Arrays (Java SE 10 & JDK 10)". Retrieved 2018-07-23. This page was last edited on 23 March 2019, at 04:32 (UTC).